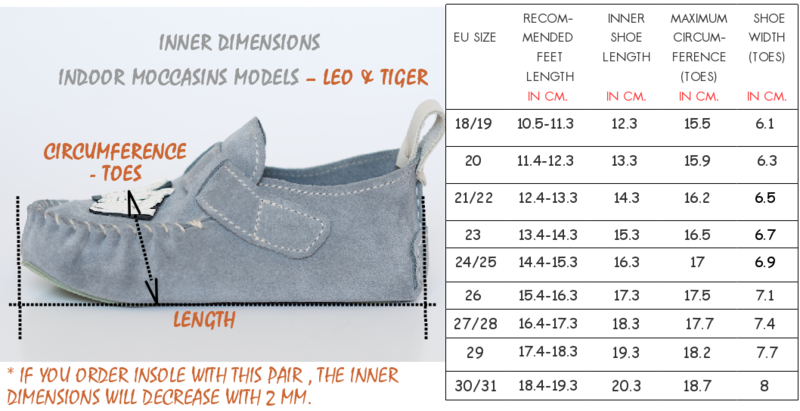 Indoor moccasins with toggle fastening. Sizes EU 18 - 31. Shoe width around the ankle is regulated with a leather lace. ZEAZOOkids recommends: This model is appropriate for first steps - the leather lace around the ankle fastens the moccasins better and they stay on the little unstable feet. - 2 mm. thin micro-cellular rubber, flat, light- weight and very flexible. - 5 mm. micro-cellular rubber, flat, light- weight and flexible - appropriate for kindergartens, where the child spends a lot of time, in-door. Products with correction in the size are not a subject to our standard return policy.